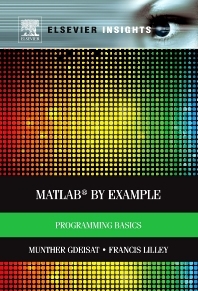 MATLAB By Example guides the reader through each step of writing MATLAB programs. The book assumes no previous programming experience on the part of the reader, and uses multiple examples in clear language to introduce concepts and practical tools. Straightforward and detailed instructions allow beginners to learn and develop their MATLAB skills quickly. The book consists of ten chapters, discussing in detail the integrated development environment (IDE), scalars, vectors, arrays, adopting structured programming style using functions and recursive functions, control flow, debugging, profiling, and structures. A chapter also describes Symbolic Math Toolbox, teaching readers how to solve algebraic equations, differentiation, integration, differential equations, and Laplace and Fourier transforms. Containing hundreds of examples illustrated using screen shots, hundreds of exercises, and three projects, this book can be used to complement coursework or as a self-study book, and can be used as a textbook in universities, colleges and high schools. Students and professionals in engineering and related fields who need to learn Matlab programming.